I don't think that this is intermediate quality. Is there any way to move it to beginner? I'm beginning to think I misunderstood the quality level needed for intermediate. Yes, this belongs in beginner. 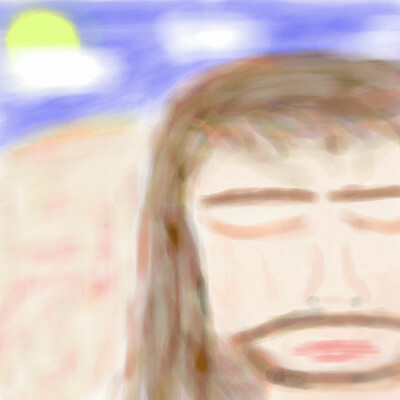 hey jesus... OMG... i thought it was really him talking to me through another vision on 2draw. i really gotta watch my self, j man is a top notch prankster. I hope you don't mind me suggesting something, but consider not using very soft brushes until later. Soft gradations are very attractive, but the fact that your pictures lack any hard edges make me feel like they're destroying the clarity of your vision. Your pictures come out as a digital blur to me, but it looks like there is something nice behind the blur if only we could see it with clarity. There is a striking composition in this picture, but it's weakened by the fact that the foreground is drawn in a way that's almost equally obscure as the background. The only thing that makes the foreground stand out somewhat is the contrast between the hair and the skin. however...i do see some potential. I have seen work of a spanish artist that reminds me of this. There is some innocence with it, which works with the subject matter. i do thing if you want to distort, you need to know how things should be drawn in order to distort well. There are certian things that must still refer to actual anatomy, even when distorting. I think you can consider adding stark, solid bright & flat colors in some places which could work agains the soft feel of the painting.